Stanford arrives in Westwood off of a bye week, and it’s heading into another one next week. On the bright side, the athletes will have the energy to go all out on one of the biggest stages in the West. 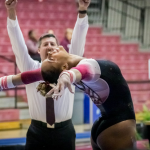 That also means that the pressure’s on since the Cardinal only has this meet and the conference championship to try to boost its ranking before regionals seedings are set. We’re anticipating the return of Taylor Lawson to lineups after her illness two weeks ago. 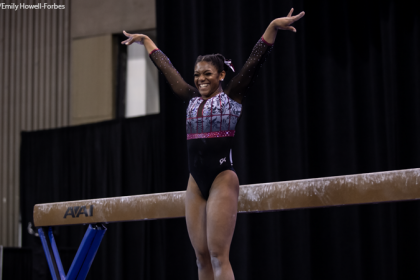 UCLA lineups are settling down, but we’ll still be watching the bars lineup—Nia Dennis seems to have returned to training this week—and for any other unexpected shuffles. 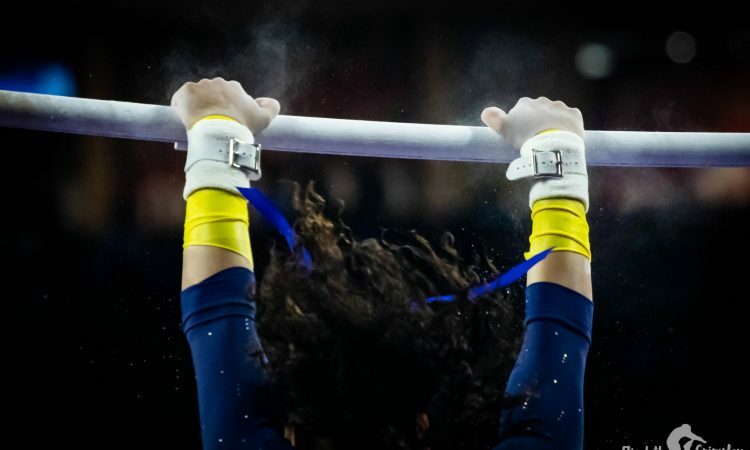 The Bruins are at or near postseason form on beam and floor, both of which are ranked No. 1, but it’s time for them to start hitting vault consistently. BRUNETTE – STANFORD: Half turn to Deltchev to overshoot, leg flicker on the catch but really impressive. Missed a handstand, double lay with a hop back. Not representative of what each team is capable of but not aggressively problematic either. Expecting things to clean up from here. Grace Glenn was rostered for that spot. Interesting switch. BRUNETTE – STANFORD: Twisting on hard, piked in the air, lands deep and immediately puts her hands down. Limping a little as she walks away – think she’s fine but that would sting. Toronjo in the exo with the usual iffy handstands and close catch on the Ray but stuck her DLO. FLATLEY – UCLA: Front aerial BHS tentative with the usual knees, side aerial, L turn to split to beat. Punch front full with another big hop. 9.925 what? ROSS – UCLA: BHS LOSO, frot aerial to sissone, arabesque turn. Switch to split, tons of height, side aerial back full, couldn’t see the landing. 10. OHASHI – UCLA: Front aerial split. BHS LOSO great. I’ve given up trying to keep track of her composition. Switch split, BHS LOSO back full, missed the landing again because a billion people are in the way but 10 signs are up. 9.975. BRYANT – STANFORD: Full in, step OOB. Under on second pass, step forward, switch side Popa great. Open double back spectacular. Looks like Dennis in the exhibition for UCLA. Hano and Kocian both on pep talk duty. Full turn, N-I-A, front aerial LOSO nailed. Switch split, did she wobble on her choreo? Laughing it off, double full slightly under with the usual hop forward. CRAAAaaaAAAaaaAAACK. 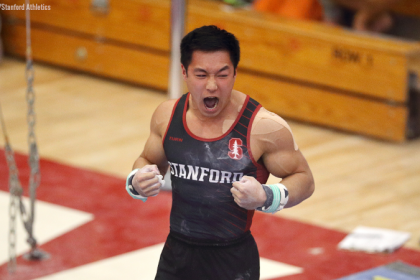 At least Stanford got some of the benefit there—I wouldn’t have gone as high on Flam, for sure—but Flatley and Nguyen’s scores were egregious. Nicole Hoffman is pacing anxiously in front of me so I’m going to guess she’s the exhibition. UCLA’s got the 198 locked down already. OHASHI – UCLA: Okay, usually I make some comment about how Frazier gets the loudest crowd response. Not today. Split leg DLO, step forward and to one side, combo pass good. Switch ring switch half. Front full Barani split drop. It’s so loud in here… shouldn’t be a 10 after the first pass, probably will be. No! 9.95. I’ll take it. Nicole Hoffman in the exhibition for the Card. Front aerial, not enough gas, lands with her chest back and falls. What a ride. Great RQS score for both teams! Scores were pretty uhh yeah but it’s fine. Tabitha’s coming over to make a fuss of Miss Val. Apparently through some complicated series of events, Tabitha changed her girls’ home schedule and made senior night on a Monday so that Val could have her last home meet on a weekend.